This is it – the final stop! No more yo-yo dieting, no more counting calories, or berating yourself because you couldn’t stick to your last diet. I get it! I know you are tired of trying diet after diet and not getting results. You wish you could be in better shape but with all the information out there, where do you even start? This is the game changer because it is ALL ABOUT YOU! There is a better way to change your body and mindset, to get control of your health and finally live your life the way you know it was meant to be. This is YOUR time! This is YOUR program. Together we create healthy habits that work for YOU. No cookie cutter plan that you can only follow for a few days and then when you can’t follow it anymore you get the feeling that once again, you failed. No “all or nothing” mentality that deprives you instead of feeling abundantly nourished. And no more doing it all on your own! The reason there are SO many diets out there is because they don’t take into account that life can be busy and hectic so when you “fall off” the diet, another one is created for you to “jump on”. And the roller coaster weight loss and gain continues and at the same time chips away at your confidence and your budget! We all have tried and we all know, we simply cannot create beautiful prepared recipes for 3-5 meals every day as life pulls us in every direction demanding our attention. Nor can we survive on grapefruit alone. Diets and pre-designed meal plans don’t take into account your personal preferences nor provide you with real, honest, expert guidance and accountability. YOU DID NOT FAIL, the approach did! engage more with your kids or grandkids when your poor health initially prevented you from doing so. take few medications, less of those medications…or even get off medications completely. take control of your life – becoming more resilient, to take productive risks, to try new things and activities, to have cool experiences, to get out of bad situations and try new, more helpful and affirming ones. improve your relationships with partners, family, friends and colleagues…even find new love (or renewed love) as a result of your increased confidence. These are just a few things you can expect to happen when you decide to invest in yourself, take time for yourself, and become the healthiest, happiest YOU! My Mind/Body Reset 120 is one hundred percent client-centered. It is designed to help you attain YOUR health and fitness goals by building a foundation of healthy lifestyle behaviors one habit at a time, giving you long-lasting and sustainable RESULTS. As your coach, you receive expert guidance, accountability and support, working directly with me each week so we can celebrate your successes together and overcome your roadblocks. No more guessing and doing it on your own. THIS IS KEY! It is very easy to talk ourselves out of doing things, to get down on ourselves, to believe we don’t have it in us, and then quit. How many times have you started a new diet or fitness plan, full of determination and vigor, but when life gets too crazy, or you have a few down days or missed days in a row, you give up? And then all the thoughts of self-doubt creep in and you wonder “can I ever do this?”or “maybe I am just supposed to be unhealthy, overweight, or out of shape”. As your Coach, I know you have it in you, and I know you can be healthy, happy, fit, lose the weight, gain the confidence and become the absolute best version of you that you want! I believe in you – even when you don’t! I hold you to your highest self and help you get there. My Mind/Body Reset 120 is designed to get you in the BEST health and shape of your life, and be able to maintain those results long-term. It is not like any other (and thank goodness, because those obviously didn’t work or you would not be here). Together you will learn new and healthy habits, that are sustainable, creating your own body and health blueprint for THE REST OF YOUR LIFE! My Mind/Body Reset 120 is a program for women over 40, struggling to lose weight and keep it off, who are really ready for expert guidance, support and accountability to finally become their healthiest, happiest self! So, are you ready to LOOK better, FEEL better, and finally get in the BEST shape of your LIFE? Quick Start Guide to get an overall view of where you are currently with regards to your health, fitness, weight, and other social and relationship areas that impact these. Daily Lessons and bi-weekly habits delivered right to your inbox. Progress is made one stepat a time and the daily lessons and bi-weekly habits will remind you what you need to stay on on track and keep progressing. Powered by ProCoach from Precision Nutrition, the number one weight loss platform that has helped thousands of women (and men) not just lose the weight, but keep it off. Weekly coach feedback and communication as well as tracking your personal physical (via measurements and photographs) and mindset progress and transformation. Weekly or Bi-Weekly expert coaching and accountability. This is you and me, one on one. Coaching calls via Skype or phone to keep you accountable, celebrate your successes, discover roadblocks that have hindered your progress in the past and work together to move past them. These calls are the heart and soul of the program and will be what keeps you going even when you don’t think you can. **EXTRA** Stick with the program for an entire year and become eligible for the Precision Nutrition transformation contest. My Mind/Body Reset 120 is the one that will get you from knowing what to do, or wanting to do, to actually doing it and seeing results. And I promise you this, it is about SO MUCH MORE than the weight you lose, it really is about THE LIFE YOU GAIN. What if one call could change your life? And as a former aerobics instructor who knew a thing or two about fitness, that took a bit of humility on her part. She had to give up on being the expert and do what she was told for a change. It was an unfamiliar position, and not a comfortable one at first. But the payoff was worth it. “I loved loved having the workouts printed out. I didn’t have to think. I didn’t have to count calories. I didn’t have to worry about next week. I just had to do each day’s task when it came up,” she says. And, as things turned out, “each day’s task” was the most she could possible manage. The hardest part of the program, for Laurie, was what she calls the “woo-woo thinking” — the kinds of lessons that asked her to look into herself and reflect. What is this mind-body stuff, she remembers thinking. Combined with her practical, can-do attitude, working through those difficult lessons forced her to break some long-entrenched patterns, ensuring she’d make a permanent change. Asked what advice she’d give to somebody else who might be considering the program. She pauses for a moment, maybe thinking about all the obstacles she faced — her age, the thyroid condition, the cancer, the move, the restaurant meals, the traveling, the loss of her sibling. Cheryl knew she wanted and needed to lose weight, but was skeptical it wouldn’t happen for her because she had tried so many diets before. Meet Patricia, 55, post menopausal and afraid of exercise. Lost 70 pounds and 25% body fat. * Oh how things change. But when your attention is on everyone else, it’s tough to focus on your needs. 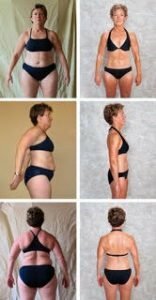 Like most middle-aged women who desperately want to lose fat, Patricia ran the gamut of weight loss pills and procedures. 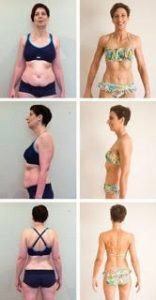 “I did the liquid diet, I fasted, I had B-12 shots administered, I did Atkins, Jenny Craig, and even went to a “weight-loss retreat” in Vermont for two weeks,” she says. But did any of it work? So with a new kid on the way and four more and a husband to take care of at home, the next few years turned into a frustrating seesaw routine of losing ten pounds then gaining twenty back. Change, it seemed, never wanted to stick around for long. Part of Patricia’s struggle to lose fat and keep it off was always feeling selfish for doing something for herself. “I felt like I’d be doing my family a disservice,” she says. But nothing could have been further from the truth. Last December, an email from her daughter Laura pinged on to her screen. It was a link to sign up for the waiting list of the January ’10 Precision Nutrition Coaching program. But when she received another email a few weeks later letting her know that she had been accepted, she felt a tiny spark. For the first time in a long while, Patricia was excited to give her fat-loss efforts another shot. And her family — grateful for all her love and wanting to see her succeed — rallied to support her. Like many women, starting strong has never been an issue for Patricia. Before she started Precision Nutrition Coaching, her all-or-nothing attitude always helped her maintain whatever diet she was on — until she took one small misstep. Once she took that small step off the path, she couldn’t get back on no matter what she tried. The guilt would eat at her and she’d feel like she could never follow through. But when she signed up for Precision Nutrition Coaching, something changed. Not only that, but the 70 pounds she lost is staying off. “Now I’m always in control,” she says. “I’ll be honest with you,” she says. “I look at the people around me — especially middle aged women — and I really want to help them. I want to show them they don’t have to settle,” she says. “They need to stop looking for a quick fix. I know they’re frustrated with Weight Watchers or whatever diet book they’re doing and I feel so badly because I know there’s a better option,” she says. That she could say this with such confidence and authority was in itself a powerful shift. Because in the past, she probably couldn’t have identified how she was really feeling. 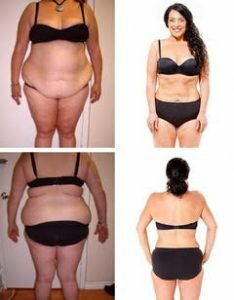 At the start of the program, her main concern – like most clients – had been with losing fat. With looking good. With how things seemed on the outside. Now she realized, her focus had altered. Instead of concentrating on the way she looked, she was more concerned with the way she felt. With her own internal experience. She was learning to listen to her body’s signals. If fact, when she didn’t follow the new, healthier habits she’d learned in PN Coaching, she felt just plain bad. Today Sharon is lighter than she has ever been. Not just in physical terms – but also in spirit. Disclaimer: All material and information presented by Nancy Leeds Gribble is intended to be used for educational purposes only. The statements made about products, supplements, or treatments have not been evaluated by the Food and Drug Administration (FDA). The information on this site is not intended to treat, cure, or prevent any condition or disease. Please consult with your physician or health care practitioner before making changes to your diet, exercise routine, or lifestyle. For all programs, individual results will vary. Client commitment and adherence to any program is necessary, and as such, results cannot be guaranteed. 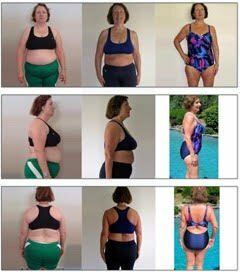 *The testimonials shown here are results from the Precision Nutrition (TM)Coaching program.